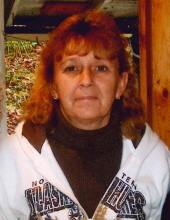 Mrs. Penny Kaye Triplett Hamby, age 57 of Ferguson, passed away Thursday, November 29, 2018 at her home. Memorial services will be held 4:30 Sunday, December 2, 2018 at Reins Sturdivant Chapel with Rev. Ricky Triplett officiating. The family will receive friends from 3:00 until 4:00 prior to the service at Reins Sturdivant Funeral Home. Mrs. Hamby was born December 10, 1960 in Caldwell County to Kelly Ramsey Triplett. She was retired from Broyhill Furniture. Mrs. Hamby was a member of Morning Star Baptist Church. Mrs. Hamby is survived by her husband; Verlon Charles Hamby of the home, two daughters; Tonya Shell and husband Mickey of Ferguson and Cecilia Elledge of Wilkesboro, a son; Curtis Hamby of Ferguson, six grandchildren; Colby Shell, Mariah Elledge, Devan Shell, Austin Elledge, MaKenzie Shell and Madison Hamby, one great grandchild; Clay Elledge and a sister; Ann Hamby and husband Roy of Ferguson. Flowers will be accepted or memorials may be made to Caldwell Hospice and Palliative Care 902 Kirkwood St NW, Lenoir, NC 28645. To send flowers or a remembrance gift to the family of Penny Triplett Hamby, please visit our Tribute Store. "Email Address" would like to share the life celebration of Penny Triplett Hamby. Click on the "link" to go to share a favorite memory or leave a condolence message for the family.